Two Macquarie University students received awards at the Audiology Australia National Conference, which was held in Sydney 20-23 May, 2018. 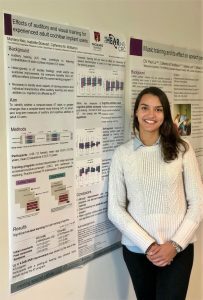 Mariana Reis, PhD candidate at Macquarie University supported by the HEARing CRC, received an award for best poster. Mariana’s poster presented part of her PhD study which rigorously investigates the effectiveness of computer-based auditory training for adult cochlear implant users. The study results showed that although participants’ performance improved during the auditory training program, these improvements did not transfer to speech understanding tasks that were assessed outside the training program, in the laboratory. Auditory training also did not have an effect on participants’ cognitive abilities, such as attention and memory, nor on listening abilities as reported by participants. These findings indicate that considerations should be made before adult cochlear implant users invest in auditory training. Rakshita Gokula, Macquarie University Linguistics HDR student, supported by the HEARing CRC, and supervised by Mridula Sharma, received an award for best Power Point Presentation for her work titled ‘Factor analysis of the skills encompassing auditory and cognitive abilities of 8 to 11 year-olds’.